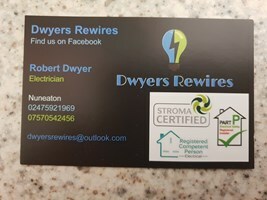 Dwyers Rewires - Electrician based in Nuneaton, Warwickshire. Hi my name is Robert Dwyer I am an electrician based in Nuneaton. The distance I cover is a 15mile radias from Nuneaton. I have been in business for 4 years and have experience in domestic and commercial electrical work. We are stroma certified so you have peace of mind all work will be carried out to the highest of standards, fully certified and insured. Or call us on 07570542456 to arrange a free estimate.